But these rates don't tell the whole story. Nunavut is lagging behind every Canadian province and territory when it comes to high school graduation, suggests a graphic released Wednesday. Data visualization website The 10 and 3 has produced a graph showing Nunavut well behind the rest of the country when it comes to the amount of people finishing high school. Nunavut had a 35 per cent graduation rate in 2011, according to data gathered from Statistics Canada. The Northwest Territories were next to last with a rate of 55 per cent, followed by the Yukon with 64 per cent. Explaining Nunavut's low rate, The 10 and 3 pointed to a National Post story about "social progression," a practice in which students pass "no matter what their abilities" until they have to face mandatory testing. But StatsCan numbers only tell part of Nunavut's story. The government's own numbers have shown higher graduation rates than data provided by the federal agency. 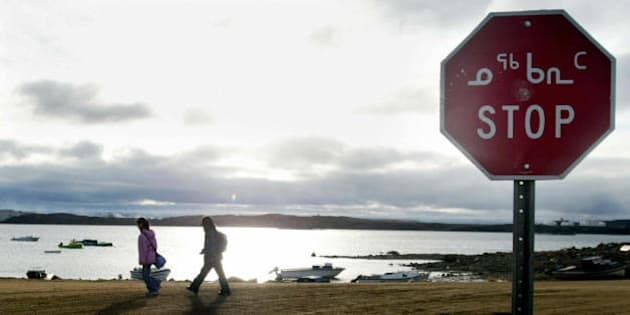 StatsCan calculates graduation rates by counting how many 17- and 18-year-olds there are in every territory and province and dividing the number by two, Nunatsiaq Online reported in 2008. It then counts the number of graduates and compares it against the average number of 17- and 18-year-olds, the website said. Nunavut's government does things differently. It looks at how many people are enrolled in Grade 12 at the start of a school year, then counts how many people graduate. Many of Nunavut's graduates are older than 18 years old. Indeed, more than half of the territory's graduates were over 19 in the 2005/06 school year. This method shows higher graduation rates than StatsCan reported every year from 1999/2000 onward, Nunatsiaq Online said. And that's also the case for the 2010/2011 school year. A government report shows that Nunavut graduated 229 students that year, compared to 570 people enrolled in Grade 12, for a rate of 40 per cent — higher than StatsCan's estimate, but still Canada's lowest. The government is trying to resolve the issue of low high school graduation by encouraging more students to go to class, CBC News reported last year. Attendance was estimated at around 71 per cent in 2014. "It's crucial for our students to be at school every day," Education Minister Paul Quassa told the network. "And to be in school every day, you will graduate and that is one of the most important messages that I would like to give to all our students." 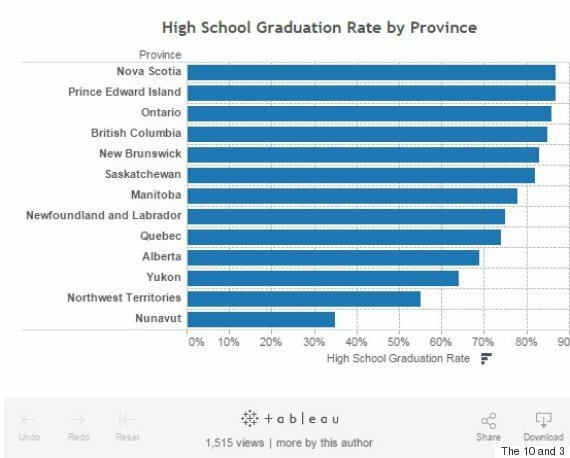 Nova Scotia, meanwhile, was tied with Prince Edward Island for Canada's highest graduation rate (87 per cent) in 2011, The 10 and 3's graphic showed.